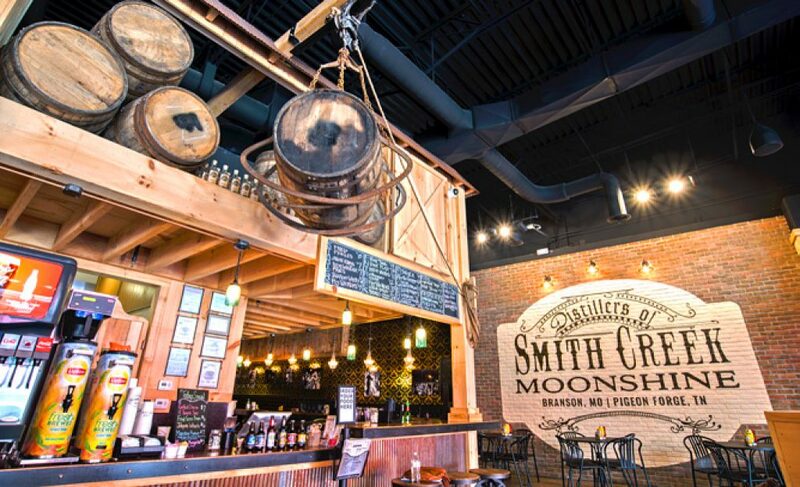 The Smith Creek Moonshine is one of the best hamburger and BBQ restaurants in Branson that features tasting bar where you can try out some mixed moonshine concoctions and a handcrafted and stuffed hamburger. Beautifully located inside Branson Landing, Smith Creek Moonshine restaurant has a retail store also where guests can purchase bottled shines, apparel, jams, sauces, dry rubs, and more. This spacious 5,000 square foot restaurant features rustic and modern designs, including a 1941 Ford prohibition moonshine hauler, and great ambiance including live music on selected nights and an in-store distillery. This unique and one of its kind restaurant in Branson offers a variety of flavors, including Apple Pie, Straight White Lightnin’, Salted Caramel, Cinnamon, Peach, Sweat Tea, Coffee, Chocolate Silk and more. You can have a tasting opportunity in this restaurant that allows you to decide which flavor of a bottle or two you want to take home. Whether you like their delightful burgers or are just trying it out for the first time, don’t miss the chance to “Shine and Dine” at Smith Creek Moonshine. Smith Creek Moonshine at Branson Landing offers guests delightful distillery spirits and delectable gourmet burgers. With their eclectic burgers which are handcrafted from fresh, never frozen, top quality beef, this unique burger restaurant in Branson has discovered the ideal combination of dining and adult beverages. Their Gourmet Hawaiian burger is topped with cheese, grilled pineapple, grilled tomato, cabbage and pineapple salad, and your choice of BBQ sauce. They also offer Sunny Side Up Burger which features smoked gouda, red beet salad, and a sunny side up fried egg. They also have yummy stuffed burgers that include a Stuffed Italian with toppings like mozzarella cheese and fresh basil and a Stuffed Greek with feta cheese, black olives, and tzatziki sauce. Other tasty treats that you can enjoy at Smith Creek Moonshine include Pig Stickers, and specialty burgers made from Elk and Bison. The restaurant has onsite distillery that can create for you incredible moonshine flavors, including Apple Pie, Peach, Sweet Tea, and Chocolate Silk. If you’re looking for a family-friendly meal, Smith Creek features kid’s menu of items perfect for young appetite. Hand-crafted moonshine, fresh gourmet burgers, and a fun atmosphere at this restaurant are all waiting for you at the unique Smith Creek Moonshine restaurant in Branson Landing. The stuffed hamburgers at Smith Creek such as bbq chicken nachos, bbq pasta, sunny side up burger, and avocado and spicy mayo stuffed burger are the best thing to hit Branson since the end of prohibition. Whether it’s the Greek stuffed with feta cheese, or the Italian stuffed with fresh mozzarella, you’re sure to enjoy a great dining experience in this restaurant. If you are looking for something with a little more non-traditional, pick the hot pig-stickers, or you can try the Elk or Bison burgers to feel the wild-side of the Ozarks. Smith Creek Moonshine is a unique restaurant in Branson that features tasting bar where you can try out some mixed moonshine concoctions and a handcrafted and stuffed burgers.